Best LED Grow Lights: With the gradual reduction in prices of LED lights, people have started using such devices for purposes other than mere illumination. These devices have created a modern revolution in indoor gardening. With the legalization of Cannabis in many countries, mainly for medical purposes, LED grow lamps have been bought in bulk as they are excellent for indoor and in-house photosynthesis and offer a cheaper alternative to traditional gardening. 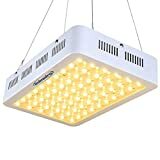 Keeping in mind the increasing demand for such lamps, this list of the best LED grow lamps of 2019 will surely be of benefit to you. LEDs, or Light Emitting Diodes, are substantially better than normal HID or fluorescent lamps: they provide more light per watt, consume significantly less energy when compared to traditional light sources, run cooler and on DC power supply (and hence usable even in countries/areas where the electricity supply is unreliable), and are safer to use. They are also free from polluting materials and are more environment-friendly. While it is true that the top LED grow lights for indoor gardening are more expensive than traditional light sources, in the long run, they are much more economical. They also require a lot less replacing. Not only have we provided the top LD grow lamp reviews, included is a LED grow light buying guide, one which will help you make an informed decision. This list includes some of the best LED grow lights of 2019. Note that each of these lights come with their own strengths and weaknesses. There is no single perfect LED grow light. You must base your purchase based on your requirements. On top of the best budget LED grow lights is this model by ViparSpectra. The company has taken great strides in the recent years, so much so that for many customers, ViperSpectra is synonymous with LED lights. 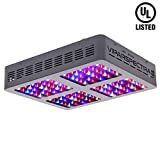 The Reflector-Series is probably one of the most powerful LED grow lights on this list as it has a 600 watts output. It is essentially an assemblage of 120 5-watt LED chips. The average lifespan is superior to most: at 100,000 hours. Besides, the company also provides three years of warranty just in case things do go wrong. These are extremely powerful and potent LED lamps: what the company has done to keep them cools is that they have added aluminum heat sinks and cooling fans. Upon testing, we found that it is capable of covering an area of more than the advertised 3 x 3 feet while suspended at 24 inches. In our experience, it is more than capable of covering an area of around 4 x 4 feet at the same height. A big reason why this counts as one of the top LED grow lamps of 2019 is that it has veg/bloom switches: this dual-power system is capable of modifying and optimizing the emitted light so as to allow the plants to flower or fruit. In both cases, this lamp has proven to be extremely capable. Overall, this is one of the most powerful and brightest LED grow lamps currently available. It is an extremely versatile lamp and is one of the best “middle of the line”600-watt rated LED grow lamps. The device also has detailed user instructions included and can also be controlled via a timer. Not being waterproof, this device must only be used indoors. If you are looking for the best budget LED grow lights of 2019, look no further. The Galaxyhydro Series has, in many ways, revolutionized the way the general public looks at LED grow lamps for the simple reason that it was one of the first companies to get into this business. 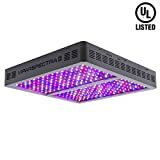 This 300-Watt LED grow light is easily a star as far as cheap LED grow lights 2019 are concerned. Galaxyhydro has incorporated both UV and IR lights in their setup. The device consists of 100 3-watt Epiled LED chips and is not designed to cover the entire spectrum. It does, however, cover the optimal 9-band spectrum which plants use to grow, including the 430nm, 450nm to 470nm, as well as the 620nm-630nm, and 740nm spectrums, besides white light and the aforementioned UV and IR spectrums. All these portions covered means that the plants will grow both quickly and will be stronger. Being a cheap LED grow lamp, it naturally covers a slightly lesser space. This budget pick does come with a two-year warranty and a hanging kit. However, it lacks a power switch and the lights cannot be adjusted for different stages of plant growth. The device can, however, be hooked up to a timer so that your plants grow as you desire. The timer will provide adequate periods of light and rest for the saplings too. Looked upon holistically, this is the best LED grow lamp for beginners. It is relatively inexpensive and yet manages to provide very impressive features. The lamp is extremely hardy and durable. It is meant for small, indoor gardens where it performs with aplomb. Kind K3 LED grow lights are extremely popular with enthusiasts of indoor gardening. These lights are great for small-to-medium gardens. Being LED full spectrum grow lights, they can be rather useful when the plant is blooming. The 90 3-watt LEDs are arranged in 6 neat groups and cover all the 12 important spectrums. The UV and IR light inclusion mean that in case you are ultimately planning to transplant the sapling outside, you can do so with ease. To help cool the LED lamp and to keep things going, there are four fans and heat sinks. When it comes to the Kind K3 L300 grow lights review, they are also pretty good choices for hydroponic and other indoor lighting purposes. They can cover an area as wide as 5 x 5 feet across (as determined in our tests) although the advertised limits are slightly lower. Onboard is a special and proprietary feature Kind calls “Secondary Optical Lens.” This ensures that the lowest and the most remote parts of the plants get their own equal share of the light. Since the entire plant can photosynthesize, this naturally makes a lot of sense. Take the 3-year warranty period offered and this is easily one of the best indoor LED grow lamps 2019. VerdictOverall, this LED light is one of the best as far as energy saving LED grow lamps are concerned. It is an excellent buy for beginners and will last for a long time. It consumes significantly lower levels of electricity and packs enough value for money features. This LED grow light is composed of 60 5-watt LEDs. Ideal for purchase as a cheap LED grow light, this model is probably the easiest to use as well. 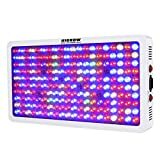 Covering the entire light spectrum recommended for indoor gardening, this model also has 5,000 lumens of brightness overall and claims to cover 3.9 square meters or an area equal to 6,200 square inches. This claim does seem to be slightly inflated; we guess that an area of 3 x 3 feet is more realistic. The first thing that grabbed our attention was that this model comes with a stainless steel hanging kit and with two cooling fans. This 300-Watt model is not Daisy-chainable; it does have a 600-watt elder sibling which lends itself to Daisy-chaining admirably. Also, in the course of the Roleadro 300-watt LED grow light review, one thing must be mentioned: that it comes with a handy two-year warranty period. Being a budget LED grow light, it is to be expected that certain features will be missing. On this model, there are no switches to control the LEDs or to control the power supply. That said, you can hook this up to a timer so that the periods of illumination and darkness are interspersed. Overall, a great budget choice. Overall, this model is a great value-for-money LED grow lamp and can be easily suspended thanks to the lightweight steel chain. It has a very distinctive look to it and comes with two years of warranty. The fact that it covers the entire spectrum while still posing a lower price tag is in itself its greatest USP. The HIGROW optical lens-series was the model we used for growing Parsley, Sweet Basil, Rosemary and Peppermint in our indoor garden. We were never disappointed. This is the brightest LED grow light on this list with an amazing 1000 watts. Together with the fact that it offers extremely decent full spectrum coverage, this is one of those rare finds that grows your plants- and weed, if you are into that sort of thing- like a boss! The lamp hangs 24 inches above the indoor garden and is composed of 200 5-watt LEDs. Such an enormous coverage means that you can easily cover a 4×3 foot area and perhaps even max out at 5×4 feet. To keep things cool and running at full capacity, this model has three fans and heat sinks. There is a hanging kit provided to get things started. HIGROW has ensured that this model covers the 12-band full spectrum, ranging from 380-760nm, and also including UV and IR. As the name suggests, there is a special kind of optical lens which ensures that the emitted light reaches to the entire plant body to ensure photosynthesis as well as better overall growth. Being a premium LED growth light, the model boasts built-in veg/bloom switches which can be used to control sprouting of fruits and veggies. Lastly, the company also offers a better-than-average 3 years of warranty. You can also turn down the LEDs without unplugging the entire setup. A must-have for the serious gardener of the indoor variety. On this one, we have a broad consensus: if you are looking for a powerful LED grow light, and are willing to shell out a few extra bucks, this is the model that you should go for. Depending on how much you use it, it will replace any of your existing lamps with dexterity. It will also significantly lower your electricity and energy costs. Yet another entry to this list comes from VipraSpectra, which has already provided another model to this list. The V1200 LED Grow Light combines a mammoth 1200 watts of light for your very own indoor garden. If you are looking for a powerful LED grow lamp, this is one of the best bets currently available. 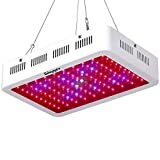 This is a very eminent contender for the crown of the best LED grow lights 2019. When suspended from a height of around 24 inches, this LED grow lamp will cover a wide 5×5 feet thanks to its 240 5-watt LEDs. There is a catch, however: given how big the device is and how illuminating, it does tend to generate a lot of heat. The company has equipped this model with fans and even a heatsink to get rid of the temperatures. Be sure to keep a temperature gauge in handy when you are operating this. While the V1200 does come with its own hanging kit, DIY-lovers will surely manage to innovate a new kind of hanging arena, something that will dissipate the light equally. This is one of the best LED grow lights for indoor gardens as it has a full spectrum design and large coverage area. Overall, when you consider the 3-year warranty and the excellent 100,000 hours of lifespan, you will realize why we have kept this item on this list near the top. As an indoor gardening tool, this model has consistently raised the bar as far as luminance and brightness are concerned. Such a device also helps in the appropriate growth of your plants in good time, which means that you can spend the entire year in a productive way as far as gardening is concerned. This is one of the top budget LED Grow lamps of 2019. In case you are looking for the best 1000 watt LED grow lights, you might want to go for this CrxSunny model. This is also our pick for the best LED grow light under $150. The one thing that we like the best about this model is that even in its comparatively small size, it is still able to generate 1000 watts of brightness. The design features and technical details of this item are significantly different. For example, unlike the other models, this one has five integrated 200-watt LEDs. It is also packed with a “COB” which stands for “chip on board,” which, many users have said and is true in our experience as well, captures and emits the truest form of sunlight so essential for photosynthesis. This is one of the top LED grow lights of 2019 for other reasons too. It is minimalistic in design and only has 5 LEDs as we said. The hanging kit is included as well while the device itself can cover up to an area of 3.5×3.5 feet while perched at the height of 24 inches. It is thus ideal for small indoor gardens and also greenhouses. Since this is a 1000 watt model, there is bound to be some heat generated. The company has strived to stave this off with fans and a heatsink. The three-year warranty does not hurt one bit. The hanging mechanism could have been slightly better. Overall, the Crxsunny COB LED is definitely one of the best budget LED Grow Lights. It also has a certain design which makes it pretty catchy. The design factor has been copied many times but has never replicated exactly. Note that in case you are using it, you should keep it in a well-ventilated area. It does tend to get very hot. A buying guide is a list of criteria that must be fulfilled in order to make the item ideal for purchase. Before you go all-out splurging on anything, in this case, an LED Grow Light, there are certain conditions that need to be met. This is why the buying guide for best LED grow lights 2019 is required. Since every person’s requirements are different, every purchase decision will be different. Do ensure that the following basic requirements are met, however. The higher the wattage, the more the power consumption. In short, you must strike a balance between the power and the economy of the device. Coverage: Like all the points on this list, this one is pretty self-explanatory. The coverage is the amount of area the LED light reaches when at max capacity. A greater coverage generally means a bigger device and a bigger kit overall. The greater the coverage area, the better the device is. The coverage depends on the size of the indoor garden. Full Spectrum Coverage: This is a term that you will find multiple times here. Simply put, the full spectrum LED grow lights actually mimic the sun’s natural light spectrum and intensity. The more the spectrum coverage, the faster a plant will grow; irrespective of which stage of growth it currently is at. As you have seen, most of the best LED grow lights of 2019 have this feature enabled. Lifespan: The lifespan of the LED is measured in hours. As you have seen, most of the LEDs on the list have an average lifespan between 50,000 and 100,000 hours. Try to buy something in that range. Replacements: Replacements here do not mean replacements of the LEDs themselves; rather, we are talking about the devices/light sources which they are designed to replace. LEDs can replace namely High-Pressure Sodium (HPS) lamps, Metal Halide (MH) as well as High-Intensity Discharge (HID) lights. Power Draw: The name explains itself. The top LED grow lamps must have adequately low power draw and use so that the actual power consumption never exceeds the rated power output. The power draw must be kept in mind to maintain the economy and power usage/wastage. Before you buy one (or two) of these best LED grow lamps of 2019, do remember that not everyone needs a 1000 watt device. Smaller ones can often be equally effective. Also, the mere presence of a brand name does not guarantee quality. Before you buy, choose wisely. And so use the comments section in case you feel we have missed out on something.